The first year of the Five Year Cycle begins with the first lunation following the heliacal rise of Saturn, at sunset of the first quarter phase of that moon. Samon equates to Irish Cétemain, the month of Maytime and Beltaine: cetsoman .i. cetsámsin .i. cétlúd síne samraid. 'May(day), ie companionship of summer of antiquity'. Refer text for further details. 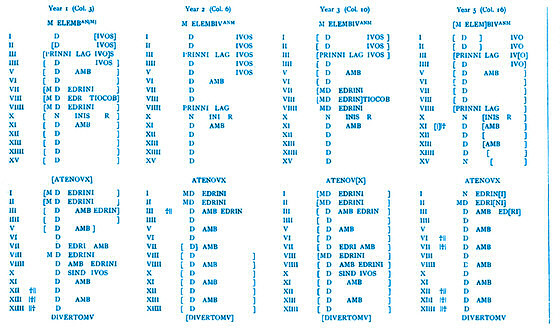 A daily calendar of correspondences to the relevant months of Gregorian year 2011 is presented below, with the individual months selectable from the menu at right. Comparing the Celtic calendar to the Gregorian calendar assists in its understanding, as the seasonal progression through the Gregorian year is familiar to us due to its use today. We can superimpose our observation of the moon's phases on the calendar dates and then meet the days in the traditional Celtic manner. We also are able to follow the passage of the five year cycle, and discover the operation of the intercalary months. Because the Celtic calendar is based on the lunar cycle, so that a month is a lunation (unlike our Gregorian calendar that ignores the moon's cycle) is is important to describe how the start date of Samon 1 corresponding to April 10, 2011 is arrived at. At left is a year-long comparison of the years in a Celtic five year cycle, where the forward and backward shift of the year in relation to the sun is shown over five years (2002 - 2006). Below is an age-long comparison of the first month Samon in a Celtic 30 year age, where the overall progress by a single lunation is shown. Together, these help contextualise the position of Celtic year 2011: it is the final year of the second five year cycle; and is followed by an intercalary month. In order to follow a calendar of correspondences, the beginning of the cycles is required. This is obtained by reference to the ancient sources, supported by the Early Irish Glossaries and Irish and Welsh mythologies. The year 2002 is shown in this interpretation of the Celtic calendar to commence a 30 year age, as this is the year of Saturn's heliacal rise in Taurus. This is based on on the dialogue of Plutarch from around AD75 that described a tradition known from Demetrius of Tarsus, who had recently returned from Britain: "Now when at intervals of thirty years the star of Cronus...enters the sign of the Bull...those who have served the god together for thirty years return home" in combination with Pliny the Elder's Natural History (17.95), compiled in AD55-79, who writes of the Gaulish Druids and specifies the first quarter moon as "the beginning of their months and years, as also of their ages, which, with them, are but thirty years". This then identifies/defines/reveals the start of the current Celtic age as 2002. 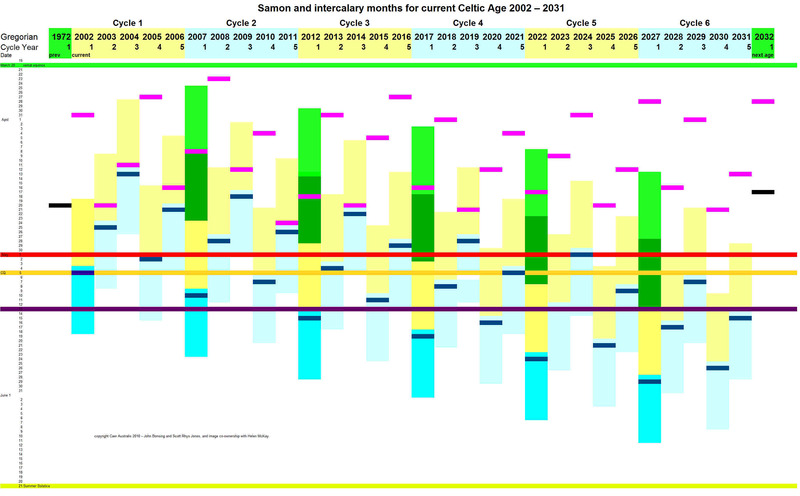 The example cycle AD2002-2006 displayed is the first five year cycle of the current 30 year age (there are 6 cycles per age).Samon in year 1 commenced at sunset on Gregorian date April 19, 2002. Showing all the months of the five year cycle allows observation of the Celtic calendar's mechanics, where each year commences relatively ten days earlier sunwise, with an intercalary in the middle of year 3 adjusts the calendar forward. The following (and current) cycle commences five days advanced sunwise compared to the cycle shown with respect to Samon, with an intercalary month prior. The solstice-ward progression of the start of the five year cycles is shown on the figure below, where a complete age's Samon months are shown relative to each other, Beltaine (May 1st), the Solar Cross quarter date (6th May), Christian Easter and Roman Lemuria. Sunset on the first quarter moon of April, 2002.
and the other visible planets arrayed. Screenshot display using CyberSky4. In 2007 when the current five year cycle commenced, Samon corresponded with April 25 to May 24. In 2008, Samon was relatively earlier and corresponded to April 13 to May 12. In 2009, the third year, Samon has fallen further back, corresponding to April 2 to May 1. By including the intercalary month in year 3, the Celtic calendar restores Samon of 2010, the fourth year, to April 21 to May 20, bringing the year to a very similar position in the solar cycle as year one. The fifth year of the cycle, 2011, begins earlier again, April 10 to May 9. By the start of the next year, 2012 the first year of the next five year cycle, the other intercalary month is introduced prior to Samon, so that Samon corresponds to April 30 to May 30. Celtic months are representations of actual lunations, and therefore the twelve months total a period some ten days short of the solar year. This shortfall of days compared to the solar cycle would lead to the timing of the months on any year being ten days or so earlier than in the previous year. The Celtic calendar keeps aligned all the while to lunations, and over periods of cycles and ages to the sun. To remove the shortfall of days with the sun, two 30 day intercalary months push forward the subsequent months by a lunation. This maintains the months in line with the Sun and the seasons. Year three commences about 20 days earlier in the solar cycle than year one; the included intercalary month makes it a total of thirteen months long, so year four commences close to the same solar date as year one. Year one of cycles 2-6 is preceded by an intercalary month also, functioning in the same manner. These adjustments of regular inclusions after every 30 lunations in an age of an additional month to make up for the shortfall of days in a year compared to the solar year leads to a surplus of days each cycle: In each cycle a 5 days solstice-wise advance occurs, adding up to one lunation over the full age. This makes the intercalary year 1 cycle 1 unnecessary, and the start date of the ages is stable, shown by comparison to the age commencing April 20, AD58. (So in the figure at left the intercalary displayed prior to year 1 of the initial cycle is not in fact used, but the intercalary month is used in cycles 2-6 of the 30 year age). 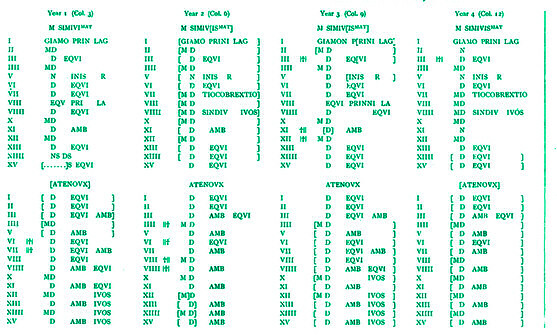 The Celtic calendar inscription tells us directly that this methodology is used: Inscribed in the preamble to the second intercalary month reads: "CIALLOS B[V]IS SONNO CINGOS AMMAN.M.MXIII [...]LAT.CCCLXXXV [..B]ANTARAN M", which is understandable as 'Sense pair for the Sun's progression - a period of 13 months made of 385 days in a year with an intercalary month' (see Introduction). The intercalary months are introduced to allow the calendar to catch up with the solar cycle, but the cumulative effect is to produce a five year cycle some 5 or 6 days longer than five solar years. Every five year cycle moves slightly forward so that after the age has completed, the calendar does not require an intercalary month at its very start. This presentation states that Samon is equivalent to the month of May, such that Samon and Cétemain are to be identified, both corresponding to the first month of the Celtic summer. However, as can be seen by the backward creep of the calendar compared to the solar cycle, in year 3 Samon is at its earliest and esentially corresponds to April, so more general term can be used: Samon corresponds to the Maytime. This has very important implications to considerations of the usurping of Beltaine in favour of Easter by Patrick in AD433, because as can be seen in this calendar of correspondences, in 2009 and 2011 Easter and the trinox samoni very closely coincide, and the fires for both feasts would have been lit, so the assumed apocryphal story of Patrick and the usurping of Beltaine is shown in reality to be plausible. "The Fena divided the year in two. During the first half, from Bealtine to Samhain, they hunted each day with their dogs"
Sunset at Lyon, 10th April 2011 at the opening of Year 5 of the current Five year cycle. Screenshot taken from CyberSky, sunset local time Lyon, France. Tara of the hill of the tribes - I invoke the land of Éire." Sunset at Lyon, 10th May 2011, the first-quarter moon for Duman 2011. Screenshot taken from CyberSky, sunset local time Lyon, France. He is Lugh, the Samíldánach!" Sunset at Lyon, 8th June 2011, the first-quarter moon for Riuros 2011. Screenshot taken from CyberSky, sunset local time Lyon, France. "At this time a great fair-meeting was held by the king of Ireland, Nuada of the Silver Hand"
Sunset at Lyon, 7th July 2011, the first-quarter moon for Anagantios 2011. Screenshot taken from CyberSky, sunset local time Lyon, France. When autumn comes I ask Alas, where is summer?" Sunset at Lyon, 5th August 2011, the first-quarter moon for Ogron 2011. Screenshot taken from CyberSky, sunset local time Lyon, France. and lull the living to sleep"
Sunset at Lyon, 4th September 2011, the first-quarter moon for Cutios 2011. Screenshot taken from CyberSky, sunset local time Lyon, France. country, from this night till this night twelvemonths"
Sunset at Lyon, 3rd October 2011, the first-quarter moon for Giamon 2011. Screenshot taken from CyberSky, sunset local time Lyon, France. by a silver chain. Take up the bowl and pour the water"
Sunset at Lyon, 2nd November 2011, the first-quarter moon for Simiuisonna 2011. Screenshot taken from CyberSky, sunset local time Lyon, France. "Echu Airem sent messengers to every province of Eriu to seek the fairest woman in the land"
Sunset at Lyon, 1st December 2011, the first-quarter moon for Eqvos 2011. Screenshot taken from CyberSky, sunset local time Lyon, France. "Brigit was born at sunrise, and bathed in milk, her breath revives the dead; a fiery pillar rises over her head;"
Sunset at Lyon, the evening of 31st December 2011, the first-quarter moon for Elembivos 2011/12. Screenshot taken from CyberSky, sunset local time Lyon, France. Aedh as close before my face and twine their arms around me"
Sunset at Lyon, the evening of 30th January 2012, the first-quarter moon for Edrini 2011/12. Screenshot taken from CyberSky, sunset local time Lyon, France. To him the live wood is a heritage"
Sunset at Lyon, 29th February 2012, the first-quarter moon for Cantlos 2011/12. Screenshot taken from CyberSky, sunset local time Lyon, France. In his 'The Face of the Moon' written after the eclipse of AD75, Plutarch recorded a festival among the Celts every thirty-years when Cronus (Saturn) entered the sign of Taurus: this is the time of the Celtic 30 year Age, also recorded by Pliny the Elder, in his 'Natural History', written from AD52-79. Saturn's thirty-year cycle in the skies most recently brought it back to the constellation of Taurus in 2002, enabling us to discover the current cycle. To mark this event, presented here are some images of this astronomical event. Here is a wonderful photo of Saturn entering Taurus and in close proximity to Aldebaran taken on January 18, 2002 - two millennia after Plutarch recorded the thirty-year Celtic festival, we can look to the skies to see what our ancient Celtic forebears saw! Saturn is the bright planet, top left, and Aldebaran is the bright star lower left, and the Pleiades cluster is to the right. Harvard University Gazette in its April 18, 2002 issue also marked the event. 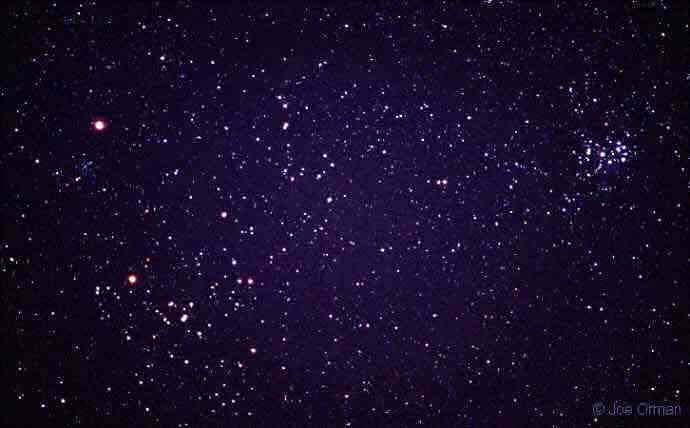 There, an image is presented showing the evening sky in April 2002, setting soon after the sun. Later that year in June, the heliacal rise of the constellation Taurus saw the planets rising with Aldebaran and the Pleiades star cluster, shown in Cybersky screensot above: in ancient times, the heliacal rise of Aldebaran occurred in May, from which the Beltaine festival arose in post-Romanisation times. December 13, 2002: Thirty years ago, Earth and Saturn had an extraordinary close encounter. The ringed planet was only 1.2 billion km from Earth--about as close as it can get--and its rings were tipped toward us. The view through a telescope was simply breathtaking. Next week it's going to happen again. "On Dec. 17th, Saturn and Earth will be unusually close together--about the same as thirty years ago," says NASA astronomer Mitzi Adams. Above: Photographer Ed Grafton captured this image of Saturn from Houston, Texas, on Dec. 11, 2002. He used a 14-inch telescope and a CCD camera. 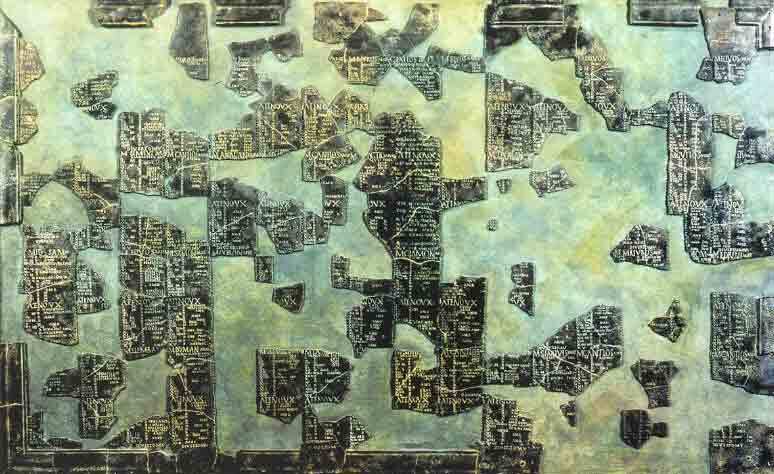 April 19, 2002 using the Gregorian Calendar of today, is the first day of Samon using the ancient Celtic calendar system. This date is therefore able to be identified as the beginning of a new Celtic thirty year Age.